Fglrx was updated yesterday in Ubuntu 10.10 Maverick Meerkat and what's special about this is that it finally supports Xorg 1.9 and 2.6.35 kernel. Up until now, ATI users who've tried to install Fglrx or upgraded from Ubuntu 10.04 would get a blank screen. 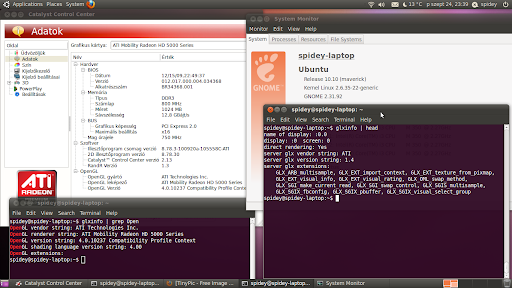 So if you have an ATI graphics card and want to use Fglrx, you can finally install / upgrade to the latest Ubuntu 10.10. Further more, another update to Fglrx came today, brining compatiblity with kernel 2.6.36 (not yet available in Maverick but it nice to already have it). This tip was sent by WebUpd8 reader Tamás Nagy who's also tested the new Fglrx drivers in Ubuntu 10.10 Maverick Meerkat and he says everything is working smoothly. Thanks to Tamás Nagy for the tip and screenshot!